Which international best-seller was set in the middle ages and featured a poisonous ink used to illuminate manuscripts? Click here for the answer. It is a challenge to identify each of the materials mentioned in this Mishnah, but that hasn't stopped people from trying. In a 1964 paper published in Chymia (that would be the International Journal for Chemistry), Martin Levey from Yale University suggested that דיו – diyo is a black ink whose color is due to soot particles. Based on prior work (by Low and others) he wrote that that the best soot came from olive oil, which was then mixed with balsam. קנקנתום -Kankantum is translated in the Schottenstein Talmud as copper sulfate. How the editors arrived at this translation is not clear. Perhaps they are basing it on אורח חיים הלכות תפילין לב, ג where the משנה ברורה suggests that it is "קופער וואסער" - "copper water". Levey claims that in Babylonia, kankantum was green and contained not copper but ferrous sulfate. In a more recent paper on the ink content of middle Persian documents, the author found that they too contained lamp soot which was gathered from inside a chimney that burned linseed oil. The soot was then sieved to produce a fine powder that was bound with Gum Arabic, made from the sap of the acacia tree. A group of German scientists recently analyzed the ink on one of the Dead Sea Scrolls and reported their findings in Dead Sea Discoveries. They used x-ray spectroscopy, in which an electron beam is bounced over the sample, and the spectrum of radiation that is given off is measured. As you can see in the figure below, the spectrum of the Dead Sea Scroll ink is similar to Gum Arabic, but it contains peaks that suggest other compounds, including a gum produced by the Acacia Raddiana, known in Hebrew as שיטה סלילנית. Not surprisingly this tree is only found in very dry or desert climates. Spectroscopy results of the ink from a Dead Sea Scroll (1QHa) marked as TG ink, compared with Gum Arabic, Gum Rasdsiana and ink prepared according to Maimonides' recipe. From Ira Rabin, Oliver Hahn, Timo Wolff, Admir Masic and Gisela Weinberg. On the Origin of the Ink of the Thanksgiving Scroll (1QHodayot). Dead Sea Discoveries, 2009: 16 (1)97-106. To our astonishment the best correspondence was found when comparing the spectra of the ink from the scroll with a sample of ours prepared according to Maimonides' recipe, dating from the 12th century. Analysis of the spectrum of the scroll ink also suggests the presence of tannins -a group of chemicals naturally found in many trees and plants. The authors note that Maimonides' recipe uses gall-nuts, which contain tannins. Maimonides' prescription could indicate the survival of an ancient use, whose actual reason had been forgotten. In this case the tannins would chemically bind the ink to the parchment collagen, explaining the surprising durability of the scroll inks as compared to the usual, physisorbed, carbon-based ink. Let's conclude with that recipe from the Rambam's Mishneh Torah, which is almost identical to the ink used on a Dead Sea Scroll that was written around 100 CE. 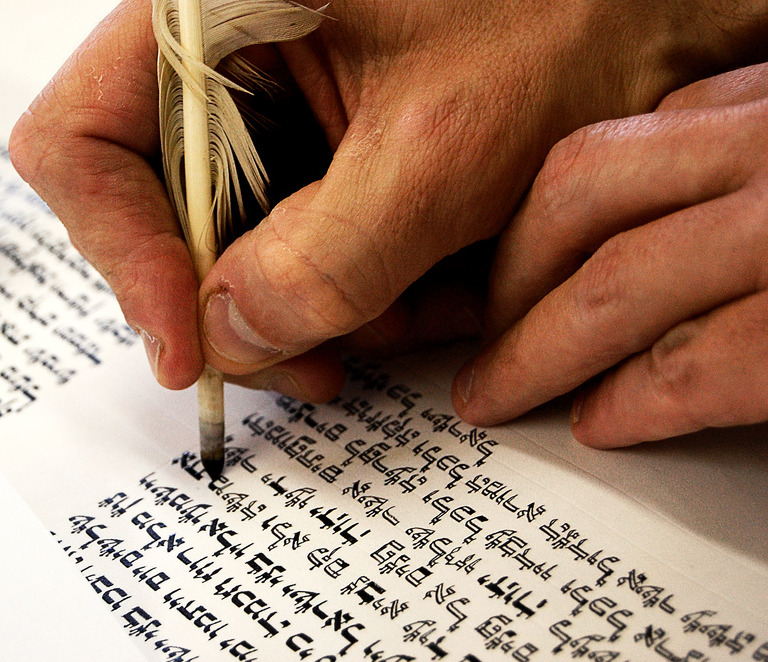 Today there are several recipes for ink, but for those who use the Rambam's, they are following a recipe that has been in continuous use for at least 1,900 years. That what the science in this daf tells us. How is the ink made? One collects lamp-black obtained from oil or from pitch, wax or similar substances; one binds them with wood resin and a little honey, and they are kneaded well and flattened into cakes. Then they are dried and put away. When they are used to write, they are soaked in gall-nut water or something similar and he writes with it. And if the writing needs to be erased, it may be erased. This is the finest ink used for writing a Sefer Torah, Tefillin, and Mezuzot. (Hil. Tefillin 1:4). Newer PostGittin 28a ~ Longevity I: How Long Do We Live?